A conversation with Dorie Clark. 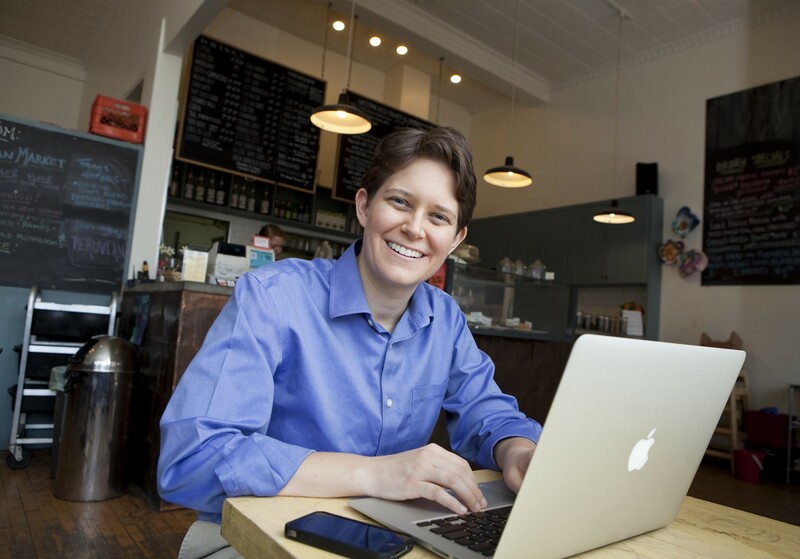 Dorie Clark spoke at TEDx conferences and also at Google Talks and she is author of Stand out and Reinventing you. Her books help people build their own idea, their brand and a following around their message. I had the chance to ask her some questions related to her books. Yakup: What advice can you give people who are not comfortable with change in their own life but still want to change in some areas? Dorie: Change doesn’t need to be extreme. In fact, it’s often better if you make “little bets” (to use the author Peter Sims’ phrase) and test out what works and what doesn’t before you make a major move. For instance, if you’re thinking of quitting your job, don’t just announce you’re leaving and then figure out a plan. Instead, start working on your new business on the side and make sure customers are interested and willing to pay you before going all in. How do you define personal brand? Can you explain how solopreneurs can implement/ change their own brand? Your personal brand is simply a modern term for your reputation. What do people think of you, and is it what you’d wish them to think? If you’d like to shift how others perceive you, you can start to take action in a variety of different ways. One great starting point is creating content, such as blogging or doing a podcast. Doing that helps you gain knowledge and expertise. It also conveys to others “this is what I’m interested in now,” and allows them to see for themselves that you make sense and have a solid perspective. Can you explain your concept of “network, audience and community” and how to build each one of them? In my book Stand Out, I lay out the process by which you can build a following around your ideas. It starts with building your network — a close-knit group of people around you whom you trust to give you advice and let you know what’s a good idea and what isn’t. These folks can serve as your early cheerleaders and ambassadors to help you spread your ideas. Next, you build your audience — people whom you don’t already know, but whom you’ve attracted to you through sharing your ideas. You can begin to build an audience by blogging, podcasting, making videos, giving talks about your ideas, etc. And finally, you build a community. This happens when you’ve built up a reasonably substantial audience, and enable them to start talking to one another — for instance, through in-person meetups or online communities. They start to unify around you and your ideas, which they’ve also made their own. They’re invested enough that they want to start spreading your message, too, and that’s how you can build a movement. You spoke also about the importance of frameworks; can you explain this in more detail and give maybe also examples for it? One way to develop a breakthrough idea is to create a framework, which is a structure that helps explain some phenomenon. For instance, many people throughout time have been fascinated by influence and persuasion, but it took Prof. Robert Cialdini to articulate that there are really only six ways you can influence someone. Similarly, lots of people talk about productivity, but David Allen created the Getting Things Done system, which takes a lot of disparate advice and puts it together into a structure that helps it make sense to people at a much deeper level. What are criteria for you to evaluate a good framework? If you’re thinking of developing your own framework, the first question to ask yourself is whether one already exists for your area of expertise. If not, and you have a way of thinking about the topic that simplifies things and makes them easier to understand, you may be able to put forward a useful framework. If a framework already exists for your area of expertise, you can think about whether there’s something missing — perhaps a facet they didn’t consider, or maybe circumstances have changed so the framework needs to, as well. You can look for openings to make your contribution. What one habit would you recommend to people in order to stand out? The best habit to cultivate in order to stand out is regular content creation. Most people consume plenty of content, but they don’t bother to create it themselves — or if they do, it’s only haphazard and sporadic. However, if you embark on a regular campaign to blog, podcast, or create videos, others can see your ideas and it enables like-minded folks, including potential clients, to find you. What are the biggest mistakes when people try to reach a bigger audience? Probably the biggest mistake when people are trying to reach a larger audience is trying to look and sound like everyone else. I did that myself, too, when I was starting out. You assume there’s a certain “correct” way to be, and so you sand down your edges and try to appear bigger or more established than you are. It’s why people use banal corporate stock photos on their websites and their web copy sounds like a press release. It turns out, though, what people respond to is your individual voice. Many people are also interested in speaking at a TED conference and/ or at a Google Talk. Can you give advices how to arrange them? The trick with speaking at a TEDx event or giving an [email protected] talk is that they’re very decentralized, so there’s not one standard application process. For TEDx events, the best move is to visit the website for the individual event you’re looking at (for instance, one in your city) and they may have an open application process. In that case, follow their instructions! If they don’t, identify who the organizers are, and see if anyone in your network knows them and can get you a warm introduction. For Google Talks, they really want their employees to suggest speakers, so it’s very grassroots. The best move there is to reach out to your contacts that work for Google and ask if they’d be willing to host you; if so, they can volunteer to organize a talk at their office. If you don’t have any Google contacts, work your network (check LinkedIn for shared connections, etc.) until you find a mutual friend who can introduce you. Do you have daily rituals that you`re doing that keep you on track for your own goals? I eschew most daily rituals, aside from my morning latte. J But one of my success secrets is focusing very intently. This year, aside from basic maintenance activities for my business, I only have two major professional goals: in the first half of the year, it was completing the joint venture launch for my online course, Recognized Expert. In the second half of the year, it’ll be launching my new book, Entrepreneurial You, successfully. Can you give book marketing advice for author`s who want to reach a bigger audience? With so much noise out there, it’s increasingly hard to reach people on social media. Instead, what still works better than anything else is email. If you’re able to get someone’s permission to reach their inbox, that’s a direct and powerful connection. One of the best ways to do this is to create a “lead magnet” — in other words, an opt-in giveaway. This should be something interesting and valuable that readers will be motivated to sign up for. In my case, I developed a free 42-page Stand Out Self-Assessment Workbook that has helped me grow my email list from 9500 to more than 47,000 in a two-year period. Folks who are interested can check it out at www.dorieclark.com/join. If you would start your career as author from the beginning; what would you focus more on and also less on? I’d focus more on growing my email list. That became important to me around the launch of my second book, but I totally dropped the ball on it when I released my first book, Reinventing You. I would definitely have created a lead magnet for that book and built a direct connection with readers. In retrospect, I would have focused less on driving people to social media and my short-lived podcast, and more on building an email list. Running a podcast is great, and it’s something I recommend to others — but only if (unlike me) you commit for the long haul, because you’re not going to see much traction with the first 10 or even the first 50 episodes. The real value comes when you build up your audience over time and all the competitors that you started with have dropped off. That’s how you win. This interview was organized by Ceyhun Yakup Özkardes.